"Yes, Cara Black fans, Aimee Leduc is back. This is the ninth of Black's novels about the chic, indomitable Parisian detective, and it has all the elements Black's readers have come to cherish: an engaging protagonist with a likable sidekick (her diminutive partner, Rene Friant), cops who hinder more than they help, villains with murky motives, grisly crimes and, above all, the unique Parisian atmosphere. 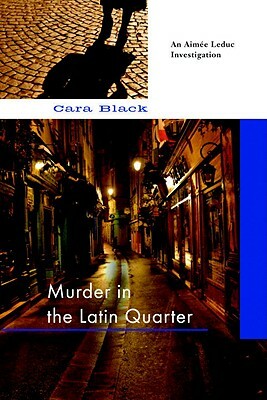 "-"San Francisco Chronicle"
"No contemporary writer of noir mysteries evokes the spirit of Paris more than Cara Black in her atmospheric series starring P.I. Aimee Leduc...The fearless, risk-taking Aimee is constantly running, hiding, fighting and risking her life-all while dressed in vintage Chanel and Dior and Louboutin heels. """-"USA Today "
"The ninth mystery in Cara Black's irresistible series set in Paris...might well be the book we've been waiting for. Aimee Leduc, Black's adorably punkish sleuth, is in her element...One of this colorful series's most scenic itineraries. "-"The New York Times Book Review"
"Kinsey Millhone turned loose in Before Sunset...In Leduc's ninth outing, Paris, as always, sparkles in all its gargoyled, dusty, cobblestoned glory. "-"Entertainment Weekly "
A Haitian woman arrives at the office of Leduc Detective and announces that she is Aimee's sister, her father's illegitimate daughter. Aimee is thrilled. A virtual orphan since her mother's disappearance and her father's death, she has always wanted a sister. Her partner, Rene, is wary of this stranger, but Aimee embraces her and soon finds herself involved in murky Haitian politics leading to murder. The setting is the Latin Quarter on the Left Bank of the Seine, in the old university district of Paris. Cara Black is the author of nine books in the Aimee Leduc series. She frequently visits Paris but lives in San Francisco with her husband and son. For more information, visit www.carablack.com. Cara Black is the author of eleven books in the "New York Times "bestselling Aimee Leduc series, all of which are available from Soho Crime. She lives in San Francisco with her husband and son and visits Paris frequently. "From the Trade Paperback edition."